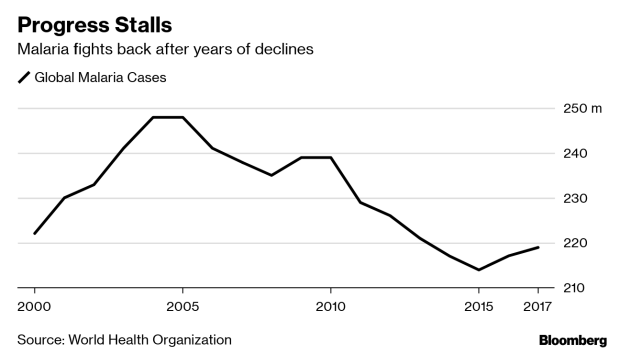 (Bloomberg) -- After more than three decades of work and almost $1 billion of investment, GlaxoSmithKline Plc and its partners are ready to deploy a vaccine for malaria, the mosquito-borne disease that kills almost half a million people each year. The vaccine, developed with the non-profit organization PATH, comes at a critical time and marks a milestone in the battle against the parasite that causes malaria. But the injection is more pioneer than panacea: it prevented only about four in 10 malaria cases among children who received four doses in a large study. With more than 5,000 genes, it’s a complicated microbe, and the pursuit of a vaccine has led to numerous dead ends since early development began around 1984, Hamel said. As the pilot starts in Africa, scientists are looking to the potential next generation of technology.